The 500,000-pound monster is designed to offer another way into space. Rockets have been the way to get satellites into orbit since the dawn of the space age. But Microsoft co-founder Paul Allen hopes to shake that up with help from the world’s biggest airplane. “Stratolaunch” is a 500,000-pound beast with twin fuselages and a wingspan of 385 feet. Allen’s Seattle-based company, Stratolaunch Systems, is developing it as a platform for lifting rockets into the stratosphere before launching them into space. It’s seen as a cheaper, more reliable route to low-Earth orbit (LEO) — the sweet spot for many kinds of satellites. The plane is still in development and has yet to fly, but last December it taxied out onto the runway at the Mojave Air & Space Port in Mojave, California. In another test last Sunday, it hit a new top taxi speed of 46 miles per hour. If all goes according to plan, the plane will take its first test flight next year. As to when Stratolaunch might begin commercial operations, no date has been given. Air-launching rockets into space isn’t a new idea. The Pegasus XL rocket built by aerospace contractor Orbital ATK launches from a modified Lockheed TriStar jetliner. NASA and Richard Branson’s Virgin Group have similar projects under development, as does the Defense Advanced Research Projects Agency (DARPA). But none of these other platforms is quite on the scale of Stratolaunch. Powered by six huge Pratt & Whitney turbofan engines, the aircraft is intended to carry up to 550,000 pounds to an altitude of 35,000 feet. It has room between its fuselages to suspend rockets from the central portion of the wing. The company has partnered with Orbital ATK to launch its Pegasus XL rocket and aims eventually to carry three on each mission. Stratolaunch was designed by Mojave, California-based Scaled Composites, which specializes in concept aircraft. The company won the Ansari X Prize to launch the first private, reusable, manned spacecraft in 2004 with its SpaceShipOne, which was also launched from a plane. Despite the ambitious nature of the project, space entrepreneur Gary Hudson thinks it has a good chance of success — in part because of Allen’s deep pockets. “If they choose wisely, they could provide crew and light cargo services to LEO for considerably less than current prices,” he says. “If they don’t, they will become a footnote to astronautical history for having built the world’s largest plane.” He added that if the plane doesn’t deliver as planned, it could become another ”Spruce Goose” — a reference to the behemoth flying boat built in 1947 that flew only once. Hudson speaks from experience, having co-founded two air launch start-ups that have since shut down: AirLaunch was developing an air-launched rocket in partnership with DARPA and the U.S. Air Force, while t/Space was working with Scaled Composites on an air-launched passenger capsule to carry astronauts to the International Space Station. There are several advantages to launching from high altitude, Hudson says. For one thing, rocket engines perform better in the low pressure and reduced atmospheric drag found at those altitudes. And air launching is far more flexible than ground-based rocketry. The launch pads used to launch ground-based rockets are costly to develop and maintain, and if a payload needs to rendezvous with another spacecraft or space station, it may be necessary to wait up to a week for its orbit to pass overhead. But the Stratolaunch concept has its drawbacks, including a smaller payload capacity than other options. A spacecraft typically weighs just 1-2 percent as much as the rocket that launches it, Hudson says. Since Stratolaunch is designed to carry up to 550,000 pounds, its payload capacity is likely to be 5,000 to 10,000 pounds. That’s enough to ferry astronauts to a space station or launch small satellites. But it’s nowhere near the payload capacity of SpaceX’s Falcon 9 rocket. SpaceX’s booster can carry 50,265 pounds to low-Earth orbit and up to 18,300 pounds to geostationary transfer orbit (GTO), an intermediate orbit where large communication satellites are launched to before they power themselves to geostationary orbit, where they essentially hover above the same part of the planet continuously. Space X makes the bulk of its non-governmental revenue from launching communications satellites weighing about 10,000 pounds into GTO, says Hudson. “So it is no threat to SpaceX in broad business terms,” he says of Stratolaunch. Then there’s the enormous cost of building such a colossal aircraft. When Stratolaunch was first announced in 2011, the plane was predicted to cost $300 million. There’s been no word on whether the project is on budget; the company didn’t respond to MACH’s request for information. 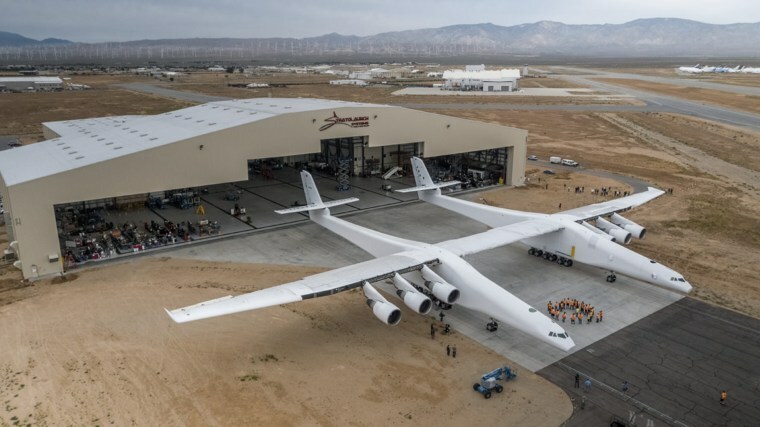 Finally, building a plane the size of Stratolaunch poses significant engineering challenges, says Mark Drela, a professor of aeronautics and astronautics at the Massachusetts Institute of Technology. "On large airplanes, the structural problems become progressively more difficult as you go up in size,” he says.